The mainstream media and blogosphere went berserk with the release of the most recent propaganda-overloaded Special Report (SR15) by the UN’s global-politics-driven Intergovernmental Panel on Climate Change (IPCC). Their stories about the report were filled with all sorts of nonsensical gloom and doom prognostications about life on Earth should the rise in global surface temperatures exceed 1.5 deg C above “pre-industrial times”, which has also been redefined with SR15. It wasn’t long ago, the gloom-and-doomsters focused on a 2-deg C change in global surface temperatures from pre-industrial times, but the point in time at which we were predicted to reach that 2-deg C threshold of all-nasty-things-to-come must have been too far in the future for them, so they revised their focus to a 1.5 deg C change in global surface temperatures to bring it nearer in time. In other words, as is characteristic of gloom-and-doomsters, the future gloom and doom is always a moving target. As the title of the post asks, do doomsters know how much global surface temperatures cycle annually? For the 1951-1980 averages in absolute global (90S-90N) sea surface temperatures, I used NOAA’s much-adjusted ERSST.v5 sea surface temperature data, which is available through the KNMI Climate Explorer. 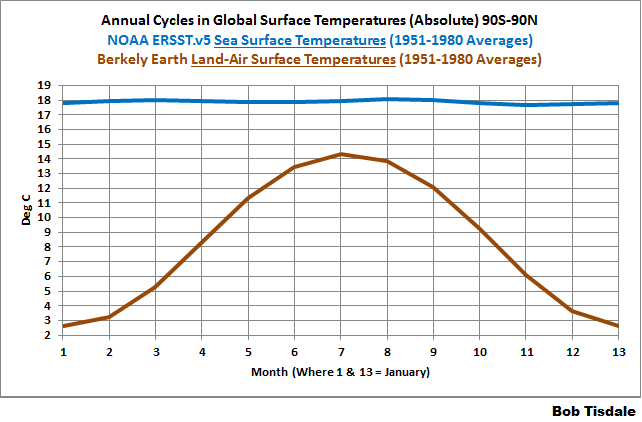 Berkeley Earth uses the period of 1951-1980 for their anomalies. The KNMI Climate Explorer is also the source of the climate model outputs. As usual, I’m presenting the average (the consensus) of the outputs of the climate models stored the CMIP5 archive, which were used by the IPCC for the 5th Assessment Report. The models for this post are those driven by the historical forcings that precede the RCP8.5 forcings used for climate projections. 1.5 deg C? Where I live, temperatures can easily drop below -10 deg C (14 deg F) in winter and rise to about 35 deg C (95 deg F) for a few days in summer. We’re used to 45 deg C (81 deg F) swings in temperature each and every year. So who cares about 1.5 deg C (2.7 deg F)? BTW, those truly are the conditions for where I live…and have been as far back as I can remember. But few people realize that global surface temperatures vary noticeably as the Earth orbits the Sun and that the annual change in global Land+Ocean Surface Temperature is more than twice the gloom-and-doomsters’ 1.5 Deg C, and much-much-MUCH greater that 1.5 deg C for the annual cycle in Global Land Air Surface Temperatures. 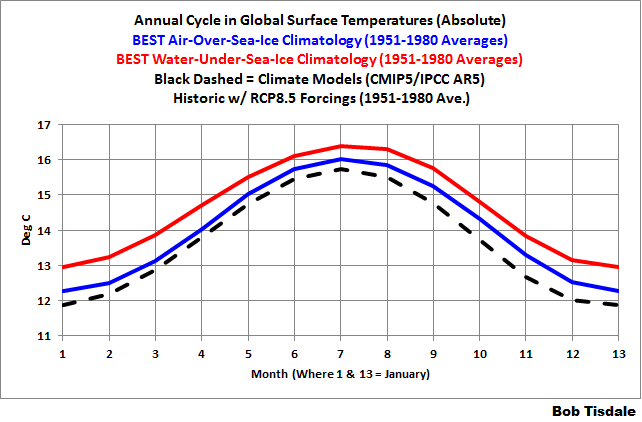 As shown in Figure 1, depending on which of the Berkeley Earth Global Surface Temperature (BEST) datasets are referenced—with air over sea ice or with water under sea ice—the average annual cycle in global surface temperatures for their base period of 1951-1980 is estimated to be somewhere between 3.4 deg C or 3.7 deg C.
Even persons (climate scientists) who live in the politics-driven fantasy worlds of climate models have witnessed in their virtual worlds, on average for the period of 1951-1980, an annual change in global surface temperatures of 3.8 deg C.
Referring to Figure 2 below, according to Berkeley Earth, the average annual cycle (for the Berkeley Earth base period of 1951-1980) in global land-air surface temperatures is 11.8 deg C (almost 12 deg C) and that, of course, is much greater than the annual cycle in global sea surface temperatures (0.4 deg C) based on NOAA’s ERSST.v5 sea surface temperature data. In other words, the annual change in global land surface air temperatures is almost 8 times higher than the 1.5 deg C long-term change that agenda-hungry, unelected UN politicians from around the globe are telling us we need to avoid. Thank you, oceans, for tempering Earth’s climate. If you have spreadsheets prepared that convert data from column form to table form and back from table to column again—as I do—it’s easy to take the monthly Berkeley Earth surface temperature data and add to it the monthly average absolute temperatures for their base years of 1951 to 1980, so that the global surface temperature data can be presented in absolute form. 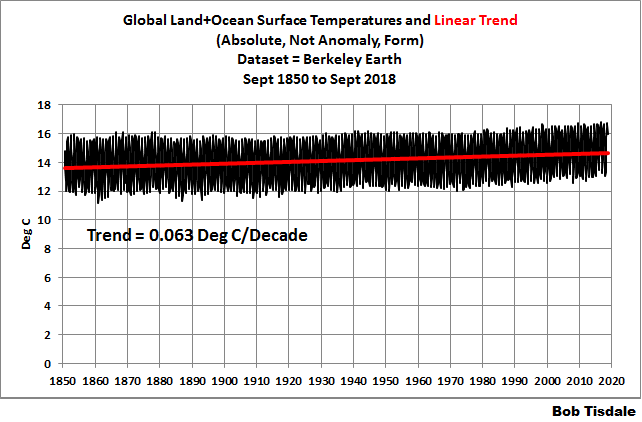 See Figure 3 for the Berkeley Earth (BEST) monthly global land+ocean surface temperatures and linear trend, from September 1850 to September 2018, presented in absolute, not anomaly, form. 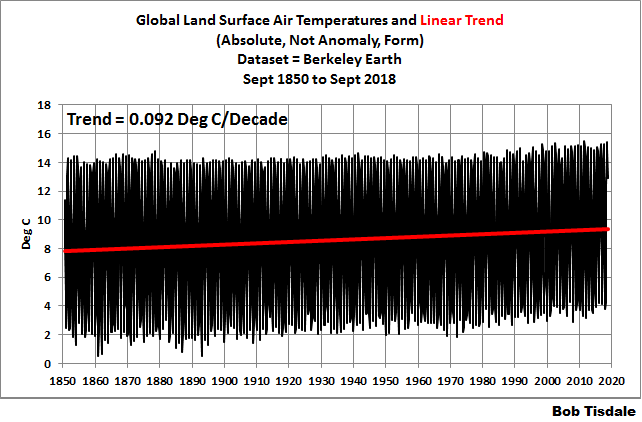 Figure 4 presents the monthly global Berkeley Earth land surface air temperature data and trend in absolute form, again from September 1850 to September 2018. In other words, there’s no ocean-based data to soften the annual cycles. Again, thank you, oceans, for tempering Earth’s climate.